Combi-rigs with an inline lead setup can create a terrible rig presentation when cast into silt, especially soft silt beds. The lead tends to plunge down into the soft silt and causes the stiff boom section to kink upwards. this makes the end tackle visible and obvious to carp in around the rig. The photos below show how easily a combi-rig can fall badly and present the rig incorrectly. It will become even worse if you use a heavy bottom bait because the lead and the bait fall very quickly and the hook link falls a little slower. This causes a loop to emerge as the combi-rig falls through the water. As the rig lands, the soft silt help to hold the lead and bait in the exact position, and this can maintain the loop in the stiff section of the combi-rig. The whole combi-rig is presented badly in silt. Most anglers believe that the loop in the stiff section will fall to the side and lay flat on the bottom, but, the lead is hidden under the silt and the loose swivel cannot work to allow the stiff boom to fall properly to the side, as a result, it stays kinked up where carp will feel the line as they pass over and around the hook bait. 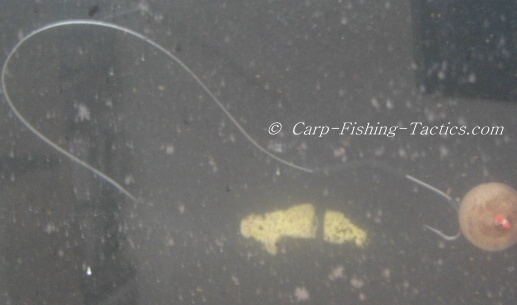 The heavy bottom bait has fallen hard into the silt and caused it to kick up the hook and braid section. Carp in any lake will steer clear of a fishing rig that lands badly in any way. In fact, a badly presented fishing rig gives carp a huge advantage because it makes it easier for them to avoid the danger bait! The above combi-rig presentation is simple no good for catching carp! This is one of the reason I prefer to use a buoyant hook bait when fishing for carp on silt beds. A slow-sinking buoyant boilie will fall gently giving the stiff section time to work effectively and push the hook away from the lead weight. A buoyant bait will also rest nicely on top of the silt bed making it clearly visible to any passing carp. Here the hook link has fallen a little better than the cobi-rigs above, but the loop in the stiff mono fishing line is still present. This combi bait presentation is still poor and will not catch any carp! 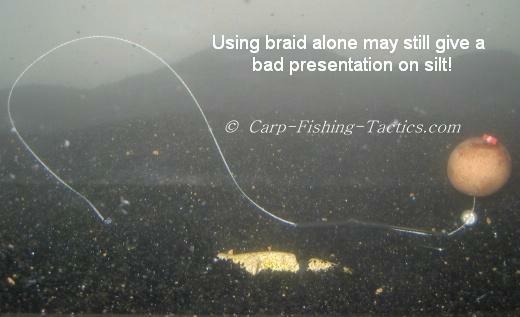 Maybe just use a braid length for silt rig presentations? Well no, your bait presentation on silt beds could still end up just as bad if you continue to use an inline rig setup for silt beds! 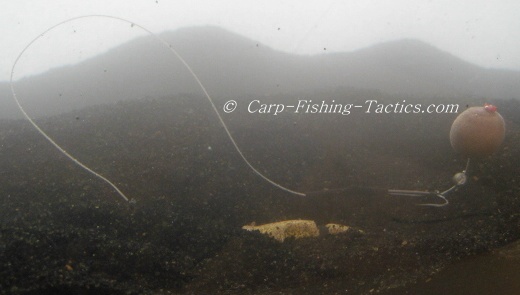 The silt rig setup still need the ability to push the hook away to present the bait well in silt. Even if you feather down the lead during the cast, the rig can still settle badly on the bottom because the underwater current could push the supple hook link over so it lays next to the rig tubing. See how a silt bait rig should be presented on silt beds!